The book is also shortlisted for the first Channel Islands Book Awards. 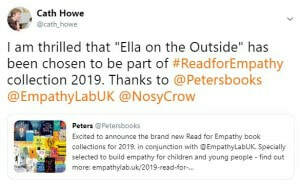 ​"Ella on the Outside" is one of the books selected for the Read for Empathy Collection 2019. Cath is a great fan of this initiative. ​More details can be found here at the Empathy Lab website. "Ella’s love for her dad is in every letter she writes"